The Pacific Science Center: This has got to be one of the coolest places to visit with the kids whenever we're in Seattle. 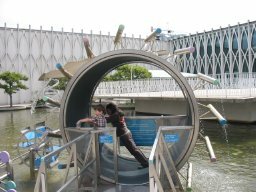 The last time we were in Seattle, we had actually planned on going to the Woodland Park Zoo but when we got there the crowds were just huge so we decided to head on over to the Seattle Science Center. That was a great decision not only because there were a lot less crowds, but also because the kids (and us) had an absolute blast. The science center is right there close to downtown Seattle, in the same square as the Seattle Space Needle and the little carnival. There is also a monorail right there that goes to Westlake mall. 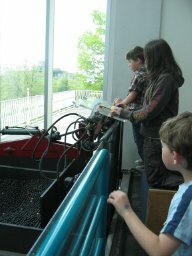 But enough about the surrounding area, let's talk about the Seattle Science Center. The thing that makes this place so cool is that it is so interactive. When we were there this last time, they had a large chess set with pieces you have to carry in order to change position. The kids already beat me at chess on a regular size board, so it wasn't too long of a game before they beat me again. They're too smart for me, that's for sure! Another thing they had there was a virtual reality soccer game that the kids thought was super cool. There was also a large area with hands on stations devoted to health and the human body, which was cool because the kids were actually able to interact with all the exhibits, something they don't get to do everyday. Trying to think back I can't even remember all the things there were to do. It was almost over-stimulating. As soon as we would start looking at one thing, our boys would be off checking out something else that caught their eye. It was amazing that we were even able to keep up with them. And going outside didn't help much. Even when we saw everything there was to see inside, there were still things to do and see outside. Overall, it's a great place to spend an afternoon. It costs a bit to get inside but if you don't pay extra for the movies the price is pretty decent. One thing that you should definitely consider, however, is using the awesome Go Seattle Card which includes admission to the Pacific Science Center as well as tons of other attractions in and around Seattle. Back from the Pacific Science Center.